This data depicts two anomalies with consistent characteristics to utilities. One is at a depth of 1.1 meters. The other 1.7 meters. 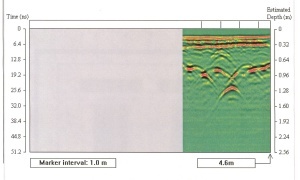 This data depicts an anomaly with consistent characteristics to a subsurface saturated soil area caused by a close proximity leak. 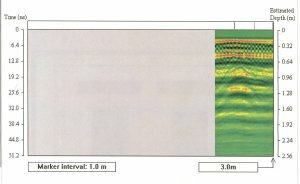 This data depicts an anomaly with consistent features to an under ground storage tank. This UST is under reinforced concrete. 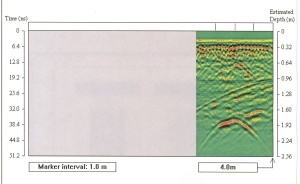 This data also depicts an anomaly with consistent features to an under ground storage tank. This UST is also under reinforced concrete but at a much greater depth. 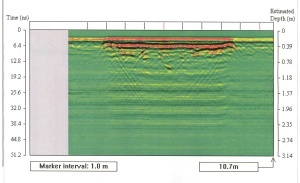 This data depicts several buried utilities in the same trench down to a depth of 1.2 meters. 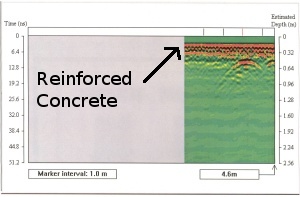 This data depicts reinforcing bars in concrete as well as a small utility buried in the sub grade. 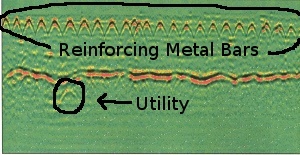 This GPR data depicts a utility, in this case a plastic pipe, as imaged without any filters. 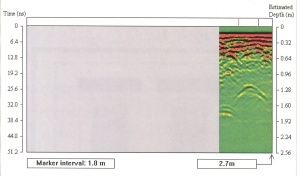 This is how it would appear using other brands of GPR. In contrast, this is the same utility scan with a special filter we call � Remove Average�. This filter allows our equipment and technicians to better view targets under metal reinforcing.